Forum Index > Makers and Manufacturers Talk > Ochs Longsword DVD VOLUME 2 is here! Posted: Mon 30 Jul, 2012 8:16 am Post subject: Ochs Longsword DVD VOLUME 2 is here! I have some big news for the German longsword community - at least those of you who are book/dvd/training material junkies! I know, I usually tease with some big build-up, but the ridiculously hot summer as made me sweat most of the creativity out of my brain, so why don't I just get right to it? Back in 2005, Hans Heim and Alex Kiermayer of Ochs Historiche Kampfkunst produced a first-of-a-kind Western martial arts DVD- a professionally filmed, edited and voiced training video for the use of the German longsword. Although this led to the release of a number of other DVDs during the next seven years, including one by Alex and Hans, and many very, very good, none has ever had the popularity or enthusiastic reviews of this pioneering work. As often happens, Hans and Alex immediately talked about a part 2 follow-up, but in the years to follow, it began to look like the project was going to live on only as unfinished and eventually forgotten promise. Well, Hans and Alex are back, and it was worth the wait! 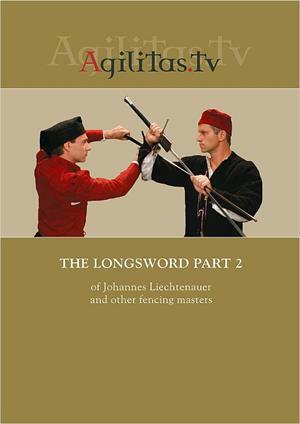 Building on the fundamentals of German swordsmanship shown in Part 1, this second DVD addresses advanced applications, including techniques found outside the "mainstream" of Liechtenauer's fencing system, and a variety of grappling and disarming techniques. Hans and Alex also show effective training methods for moving from formal "plays", to free-form drills, to finally, approaching free fencing. Read this and 30 seconds later went to your site to order it.
" Ridolfo Capoferro's The Art and Practice of Fencing ". Overdue to buy another good book from you guys and help keep you in business, and the video should be instructive and very much fun to watch. I swear, you are more reliable than the atomic clock! Thanks, as always, for your continued support, my friend! Speaking of reliability, just got an e-mail today at 10:23 A.M. EST confirming that the package has been shipped. Not overly surprised since most of my previous orders where shipped the very next day. All the books and DVDs I have purchased have been of high quality content and presentation ( Photographs, illustrations, period artwork reproduction, book design/aesthetics " mise en page " ). Got the book and the DVD last Friday and I'm really pleased and impressed with both. The DVD shows a lot of subtle techniques and some very useful training exercises: Very professionally shot and produced and even more useful if one already has the part1 DVD. Actually I would recommend that anyone who hasn't the first DVD should buy the Longsword Part1 DVD at the same time as the Longsword Part 2 DVD as the second DVD doesn't recap or summarize basic techniques and assumes that one is at least familiar with German longsword techniques. This book is an extremely clear and easy to read translation of the original text and has very good copies of the original artwork. I also find that the emphasis is on general principles and each techniques seems to explain the reasons why things are done i.e. tactics and not just a recipe/enumeration of a sequence of moves. There are also summarizing comments by the author and a lexicon of all the technical terms and their meanings. This book so inspired me, that although the rapier is later than my usual period(s) of interest I was motivated to buy a good A&A Dresden rapier from Kult of Athena today ..... it is a rather sword-like bladed rapier with a cut and thrust blade, but I like " BIG " blades. Maybe eventually I might buy a more thrust specialized rapier. You raise a good point, and perhaps I should tweak the website copy to reflect this. Volume 2 is truly a sequel; it picks up where volume 1 left off, and presumes that you know what is contained therein.